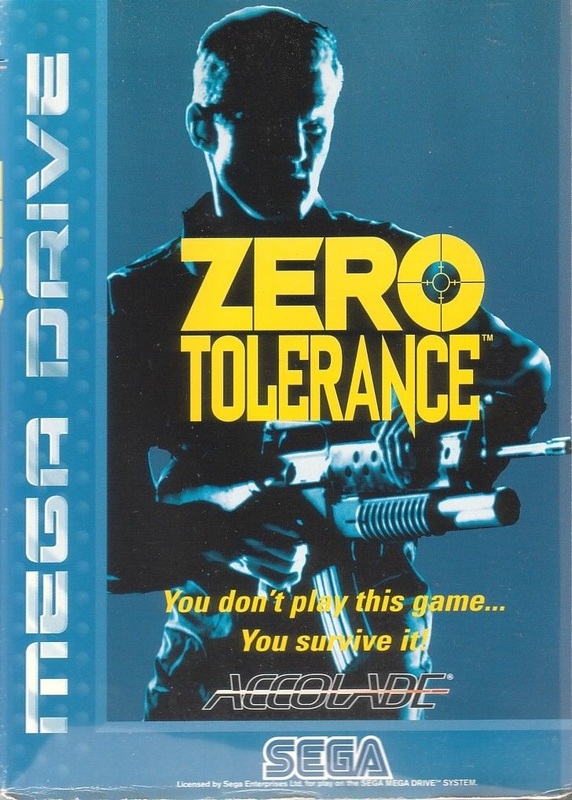 Zero Tolerance is a 1994 video game developed by Technopop and published by Accolade exclusively for the Sega Mega Drive/Genesis video game console. It was one of the few Mega Drive/Genesis first person shooters, besides Bloodshot and the Duke Nukem 3D port. Zero Tolerance is made up of 40 levels spanning three separate areas: the space warship Europe-1, an abandoned merchant freighter, the heavily fortified central command building for the Planet Defense Corps, and the sub-basement areas of that building. The object of the game is to kill all of the enemies on a level and then proceed to the exit, which is either a staircase or elevator leading down to the next level. However, nothing prevents the player from heading straight towards the exit without killing all of the enemies. If this is done, the player is simply not given any passwords until the entire area is finished. Zero Tolerance features five different characters from which the player can choose to play, each one being a member of a crack commando squadron of the Planetary Defense Corps, an elite group codenamed Zero Tolerance. Each individual character has a unique ability which has a slight effect on gameplay, as well as different items they start with at the beginning of the game. All characters are named after the game's developers. Captain Scott Haile - Codenamed "Psycho", and an imposing physical specimen, African-American Haile was an institutionalized pyromaniac as a youth. Haile has extensive specialty training in explosives, demolition, ballistics, bomb defusal, and countermeasures. His hot-headed nature is often a cause for concern for his fellow soldiers, and he has received a small number of disciplinary actions from his superiors. Haile's personal profile is classified, and much of his background is considered top secret. Haile is the Captain of the Zero Tolerance squad. Captain Satoe Ishii - Codenamed "Soba", Ishii, a Japanese-American servicewoman, is a former captain in the radio operator division of the special forces. Although her specialty is in communications and communication technology, she is a highly decorated servicewoman with extreme physical prowess, hearing and eyesight. Ishii is a highly accurate marksman who can consistently hit a target with a size of 2 centimetres (0.79 in) at 100 metres (330 ft). Major Justin Wolf - Codenamed "JJ Wolf", Maj Wolf is also an imposing physical specimen of Scandinavian origins, and had a highly decorated career with the Army Medical Corps before becoming the team doctor and surgeon for the Zero Tolerance squad. Wolf can make the best out of medicines, medical apparatus, first aid kits and pharmaceuticals and can patch himself up better than most. Wolf also has a combat specialty in extensive small firearms training, and is an expert pistol shooter. Major Tony Ramos - Codenamed "Weasel", Maj. Ramos, before becoming a Zero Tolerance commando, came from another squadron in special forces who specialized in counter-terrorism, reconnaissance, and sabotage. As such, Ramos is a specialist in infiltration, information gathering, stealth and evasion. Ramos is also the best trained commando of the Zero Tolerance squad in hand to hand combat. This means he is best character in situations where no firearms are available, and is capable of quickly dispatching an opponent with his bare fists. Major Thomas Gjoerup - Codenamed "Basse", Maj. Gjoerup is the electronics expert for the Zero Tolerance squad. Basse is also a specialist in security and surveillance systems, reading of schematics and blueprints, radar, and electronic mapping, scanning, and guidance systems. An army psychiatrist has deemed Basse the most psychologically unstable of all the members of the Zero Tolerance squad. Basse has received multiple disciplinary actions for insubordination, refusal to follow orders and conduct unbecoming an officer. GamePro gave the game a mostly positive review, commenting that "First-person games like Zero Tolerance really put pressure on a system's processor, but Accolade has done a good job here: The anxiety caused by an adversary careening around a corner or the twitching body of a gunned-down spider is severe." They additionally praised the large and labyrinthine levels, cooperative multiplayer ability, and limited but effective sound effects, though they criticized a few elements such as how slowly the player character turns.